The AE2000PLUS Commercial Telephone Entry System is our large screened option designed to provide secure access control through four doors. Apartments, condominiums, gated communities, dormitories, parking garages, hotels/motels and business offices with as many as 10,000 residents or users can take advantage of the AE2000PLUS Telephone Entry System. Install the AE2000PLUS in the lobbies of a building or outside the doors for secure access control. For stability purposes, the AE2000PLUS can be surface, gooseneck or recess mounted. With its hands-free option, this Telephone Entry System allows visitors to communicate with residents to request entry. 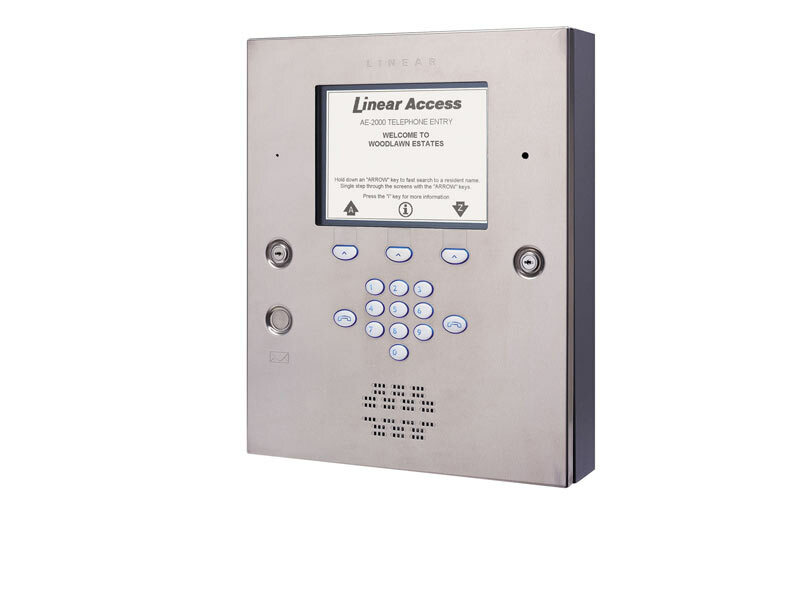 The AE2000PLUS Telephone Entry System is contained in a locked, rugged stainless steel encasement and is designed with a telephone style keypad with backlighting for easy viewing. The LCD display shows a welcome message of choice along with a directory of resident names and codes. Our AE2000PLUS Telephone Entry System integrates a built-in microphone and speaker allowing easy two-way communication between visitors and residents. Residents are able to allow visitor entry using the heavy duty access relay. The AE2000PLUS optionally supports a color CCTV camera for even more security. The AE2000PLUS also allows programming for event programming, entry time restrictions, certain location restrictions, and administration functions to aid in the installation process. The system features 32 security levels, 32 time zones, 32 door schedules, and 24 holiday schedules. AXNET software or AccessBase2000 software can be integrated with the AE2000PLUS depending on what functionality is required for a specific facility’s security needs. The AE2000PLUS Telephone Entry System also includes two Wiedand inputs for connecting 26, 30 or 31 bit Wiegand devices, and three sets of PBUS inputs are included for connecting Linear’s optional accessories for further security. There are no children categories of Linear AE2000PLUS Four Doors.